Authoritative parenting and authoritarian parenting are the two most common parenting styles. These two types of parenting have similar names but very different principles and effects on kids. Here are the characteristics of the two parenting styles and their outcomes. Parental Warmth Warm, nurturing and involved in the child’s schooling and life. Cold, non-nurturing and less involved in the child’s schooling and life. Freedom Autonomy and independence are allowed. Bidirectional communication is encouraged. Do not allow independence. One-way communication. Children’s opinions are not heard or allowed. Discipline Very consistent in disciplining using non-punitive measures such as time-in or natural consequence. Focus on teaching correct behavior. Punitive. Focus on punishing wrong behavior to deter future occurrence. Control Allow freedom within reasonable limits. Encourage autonomy and independence. Believe in total control over kids, behaviorally and psychologically. Kids are expected to obey parents without question. Mood Tend to be happy and content. Tend to have unhappy dispositions. Self-esteem Have high self-esteem. Are more assertive and self-reliant. Are insecure and apprehensive. Some are also submissive and dependent. Self-Regulation Good emotional control and resilient. Recover from setback quickly. More likely to become hostile and regressive under pressure. Relationships Affiliative. Well liked by peers. Non-affiliative. Tend not to get along with peers. Mental Well-being Good mental health. More mental issues such as depression, anxiety and drug use. Academic Performance High academic achievements. More active in school activities. Generally lower academic performance, but inconsistent results are found in some sub-population. Compared with authoritarian parents, authoritative parents are likely to be warm, nurturing and responsive. According to Attachment Theory, developed by psychologist, Mary Ainsworth in 1970s, responsive parenting creates secure attachment in the child. Children with secure attachment are happier and healthier. Many studies show that children raised by authoritative parents are indeed more content. Because authoritative parents are responsive to their children’s emotional needs, kids from authoritative families have good emotional control. They are resilient and can recuperate quickly from setbacks. Authoritative parents allow their kids to seek autonomy and independence. Children are involved in making decisions for the family. Bidirectional communication are encouraged. Authoritarian parents do not involve children in decision making. Kids are given orders instead of requests from the parents. Authoritative parents discuss and explain rules to their children. They are open to give-and-take discussion and will modify rules if appropriate. Children are taught to think critically about the reasons behind each rule. Because kids with authoritative parents can speak their mind and participate in decision making, they are more assertive and have higher self-esteem. Authoritarian parents only allows one-way communication. They use “because I said so” as the reason for rules. Children are expected to blindly obey without questions. They are not allowed to have or voice their opinions. Kids are often “seen but not heard”. Kids from authoritarian families are insecure and apprehensive. Both authoritative and authoritarian parents hold very high standards and control over the kids’ behavior. However, authoritarian parents also impose tight psychological control over their kids. Authoritarian parents believe that they are the authorities who are always right. Their kids need to accept their judgement and values at all times. These kids are usually submissive and dependent as a result. 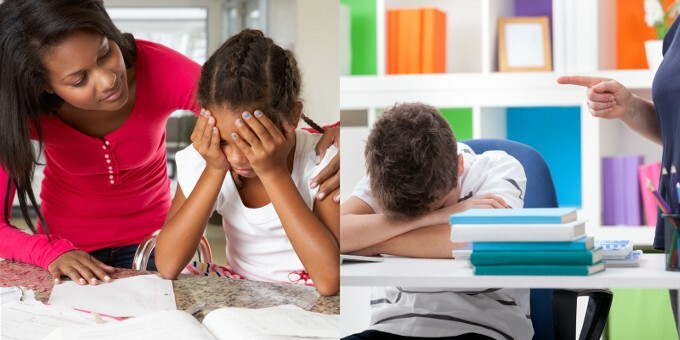 Authoritative parents tend to use non-punitive measures such as time-in and natural consequence to discipline. Authoritarian parents favor punitive punishment. Interestingly enough, although authoritative parents allow children to have more freedom and autonomy, their standards are usually higher than the authoritarian parents’. They also follow through on the consequence more consistently. Authoritative parenting results in better outcomes in children overall. The only exception is that some inconsistencies in school performance are found in other ethnic groups, such as African Americans and Asian Americans. Having high standards and enforcing limits consistently may be the reasons why kids with authoritative parents achieve higher academic results. Another factor is the high parental involvement. Authoritative parents tend to monitor children’s homework and volunteer in their schools. Research has found that involvement by parents is directly linked to better school performance. But authoritarian parents also have high standards and enforce limits. Some are also very involved in the child’s schooling (e.g. Tiger mom parenting). This could potentially explain why in some cultures, such as the Chinese, authoritarian parenting is associated with better grades. However, authoritarian parents hold tight psychological control and favor punitive punishment for discipline. Despite the academic success, kids with authoritarian parents are more depressed and have more mental issues. Parenting styles and learned resourcefulness of Turkish adolescents. By Türkel YD, Tezer E.